Pizza day is easily the best day of the week. Of course, if you play your cards right every day can be pizza day. But growing up, Fridays were the one day of the week consecrated to the cheesy, carb-y, and altogether best thing to happen to this world blessing called pizza. Back to salad the rest of the week. Except my mother’s Greek and we grew up in Rome, so salad for dinner was never a thing. We are not rabbits. Pizza consistently serves as one of those things that brings me joy to the point where it has truly become a passion of mine. I honestly think I like it more than I like most people. There’s just something so comforting about it, possibly stemming from the fact that if you’ve committed to eating the whole pizza you’ve committed to throwing health-related caution to the wind and don’t have to stress about calories or cholesterol or the gym you’re probably never going to. It’s freeing, truly. 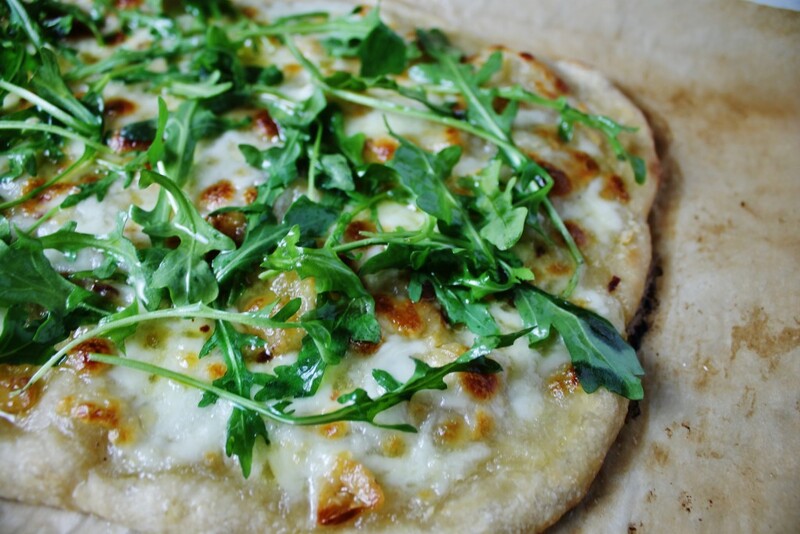 This particular pizza is one of my favourites, and the fact that it contains some sort of greenery makes it not really that bad for you! I never used to be a fan of white pizzas, but since the first time my mother made this recipe, I’m a convert. 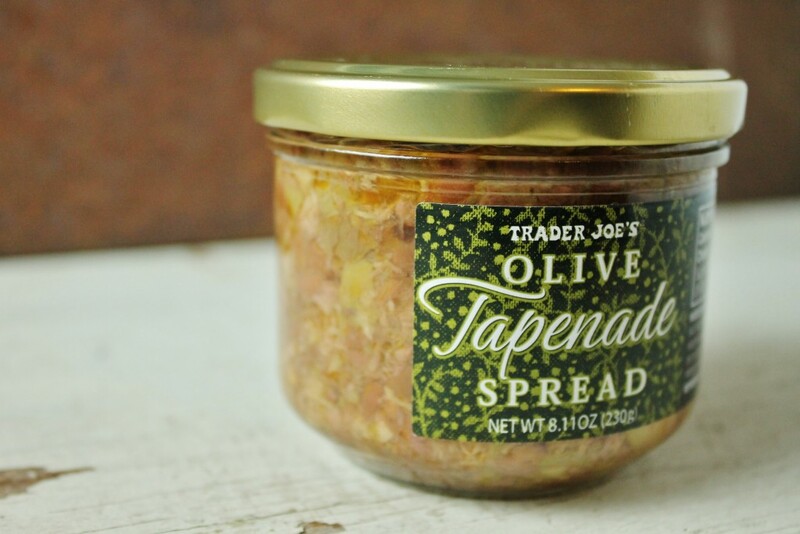 Worth noting- this olive tapenade from Trader Joes is a godsend, and I use it on everything from toast to pizza to sandwiches. If you don’t live near a Trader Joes, a similar effect can be achieved by chopping up some kalamata olives and marinating them in a bit of olive oil and garlic. But as it won’t be the same thing, I recommend hunting for a good tapenade. It’ll be worth it, I promise. Also, all props for this masterpiece of a meal go to me mam, whose blog you can find here. Check it out for “real” (she’s a legit chef, plus as mentioned she is Greek so there’s all the legitimacy you could ever ask for when it comes to food) recipes! Preheat your oven to 450F. Line a sheet pan with parchment paper. On a lightly floured surface, knead the pizza dough then let rise for approximately an hour in an oiled bowl covered with a towel at room temperature. Meanwhile, begin assembling your ingredients. To make the garlic oil, heat the 4 tbsp. olive oil in a pan with the garlic cloves until the garlic is a light golden colour (about six minutes on medium low), then remove from heat. 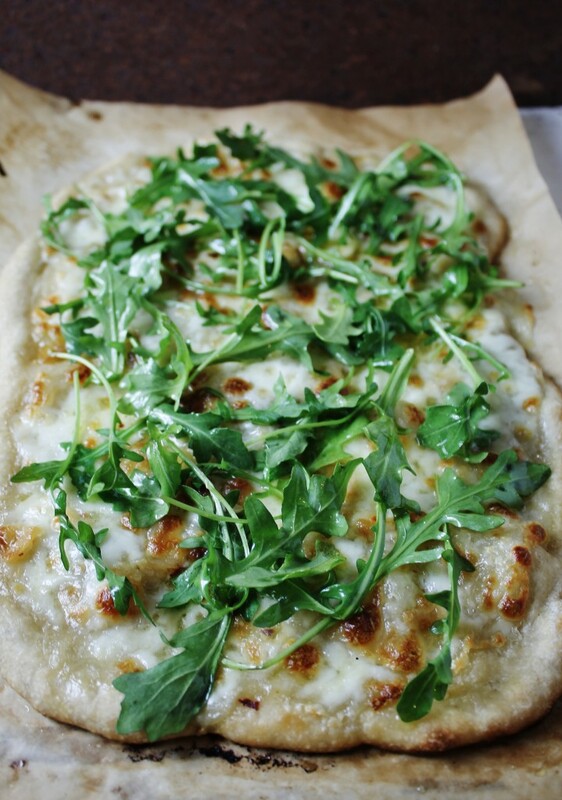 Form your dough into the desired shape, then brush with the garlic oil. Bake for about five minutes and remove from oven. 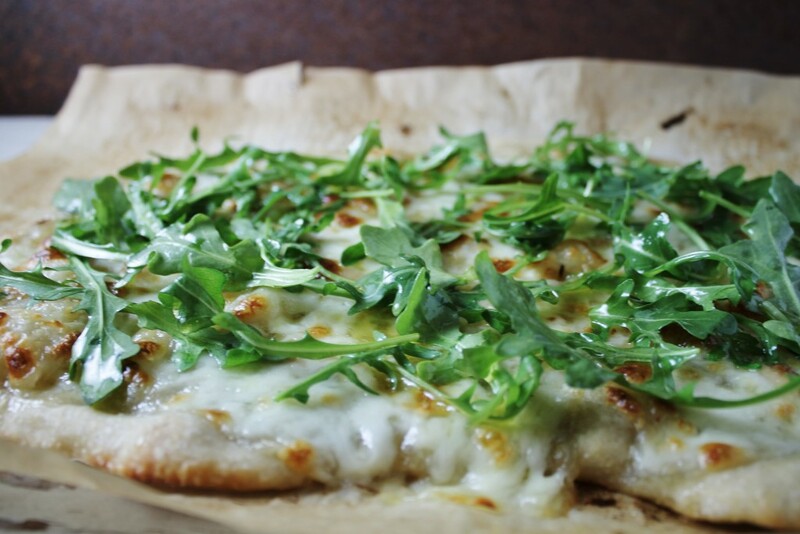 Spoon the olive tapenade evenly across the surface of the pizza, then add the mozzarella. Pop back into the oven and bake until the cheese is golden. 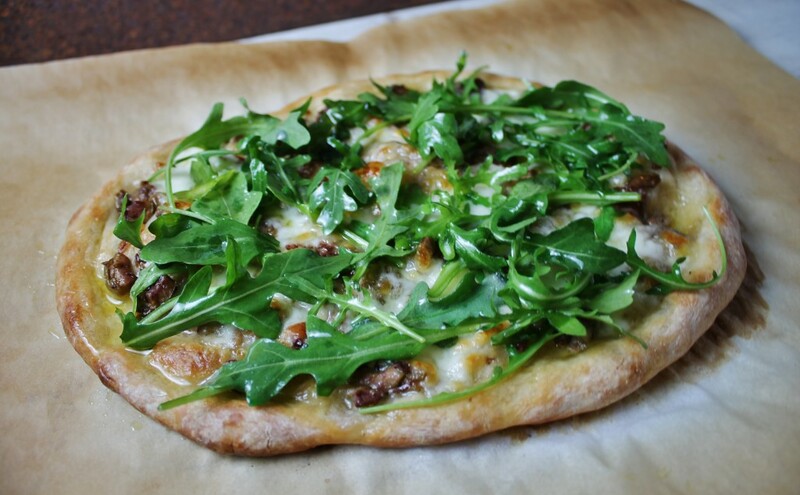 Toss the arugula onto the finished product, and serve immediately! Pro tip: while this pizza tastes incredible, it does not reheat well… so you’re going to have to eat it all in one sitting. Ugh, sacrifices.